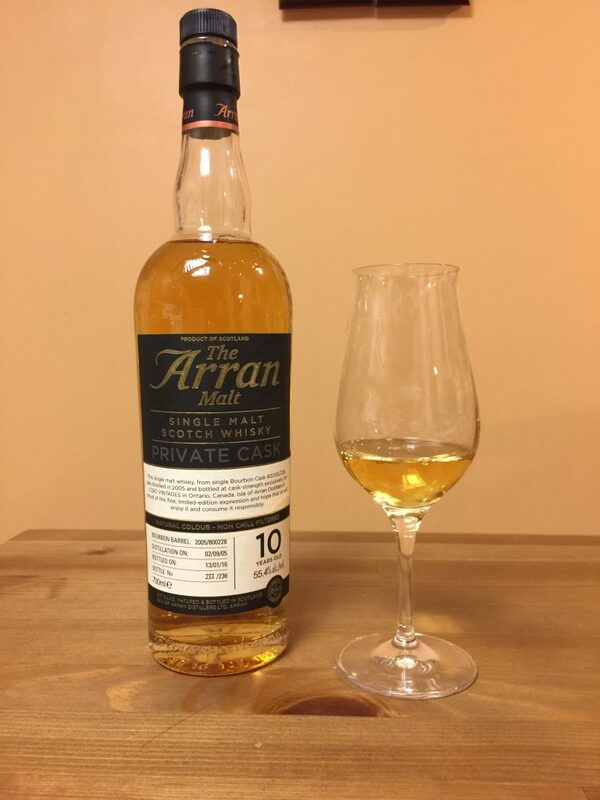 Whisky Review – Arran 12 CS, Amarone Cask, Tokaji Aszu Cask. Container: Glencairn Neat with a few drops of distilled water, rested for 30 minutes. Palate: Very nice in the mouth, bit of salt, very little alcohol burn, chocolate, sweet cake, few more drops of water opens up fruity notes and hints vanilla in the background. Finish: Long finish, lingers around in the mouth with oak and spiciness. Not too complex, has a nice nose with a lot of malt, good mouth feel, but lacks complexity. Nose: Red fruit jam, raisins, hints of oak, honey, chocolate. Palate: Dark chocolate, cooked fruits, more burn than the 12CS, tiny tiny hint of spice. Finish: Medium finish, mouth warming, fruit lingers for a bit with a soft oak flavor. Offers a bit more than the 12 CS, there is a surprising amount of alcohol burn compared to even higher proof whiskies. I enjoy the wine influence here in this whisky. Nose: Hints of sourness, orange/citrus, sweet flower notes, a small hint of grass. Palate: Smother than the Amarone Cask, red grapes, hints of orange and pear, vanilla, more matured fruits, hints of oak. Finish: Long and complex, kicks in with a small bit of salt, fruity notes, spice, yeast. This is the most interesting one out of all three, and the most complex, a really special finish, opens up really well with few drops of water, I would buy a bottle if I could get my hand on it. Tried it at Via Allegro with over 1000 whiskies in their collection.